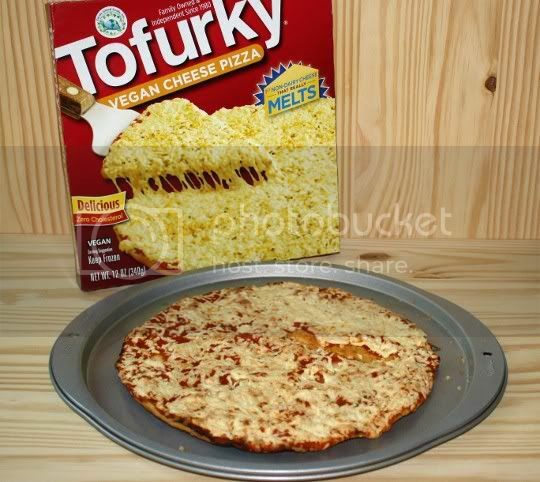 Ahhhh...the long awaited, highly anticipated, ever unattainable Tofurky frozen pizzas. After much web speculation and rumored ETAs and appearances, they finally became available in LA...and I dropped everything to rush out and buy them. Yes, I sat through evening rush hour traffic to make my way from West LA to Locali Conscious Convenience in Hollywood, where I proceeded to pay almost $10 for each pie. So I know you're thinking...are they worth it? And the answer is...YES!!! 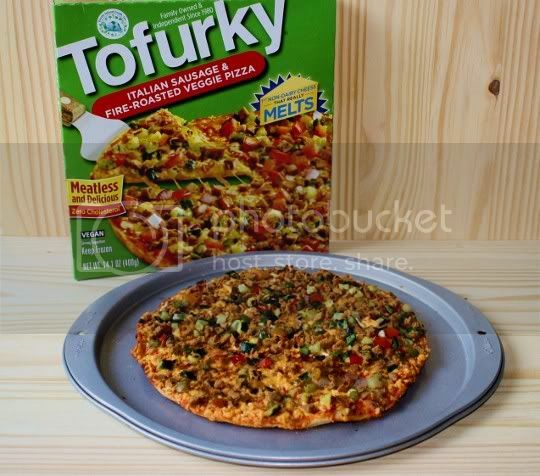 Seriously, these 100% vegan pizzas are worth whatever trip you have to make and whatever money you have to spend (well, try to find them cheaper). I'm vegetarian (not vegan), but it's foods like this that would make it easy to change anyone's mind. 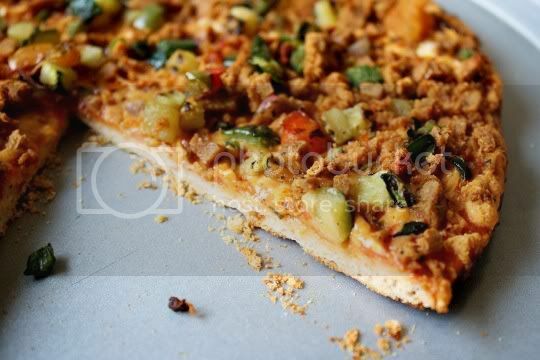 Now, we're not exactly talking GOURMET here, but for a frozen pizza (that's vegan), it's quite a milestone and worth stocking a few in your freezer. The back of the box states, "Wrap and refrigerate leftovers, if there are any!" That advertising couldn't be further from the truth. 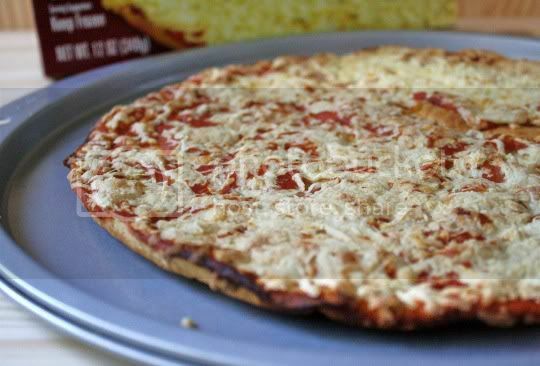 One serving size is 1/3 of the pizza (or about 2 slices), but there's absolutely NO WAY you will be able to stop at that. Hell, I couldn't stop eating it, and it's VERY easy to eat the whole thing! The pizzas come in three flavors: Cheese, Pepperoni, and Italian Sausage and Fire-Roasted Veggie (you can probably guess which one is the best). 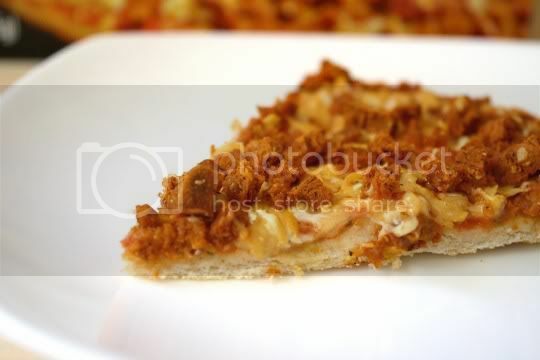 Each one has a thin, crisp crust, topped with a sweet and tangy tomato sauce and shredded Daiya cheese. They take about 15-20 minutes to bake at 425 degrees F (the back of the box suggests 10-12 minutes at 420 degrees), but you'll probably need to leave them in for this long for a crispy crust. 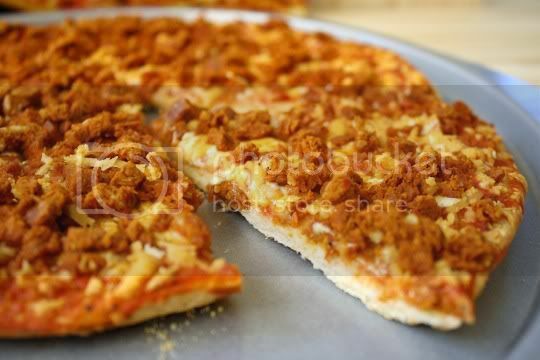 Eat as soon as possible for best results, as the crust tends to get a bit soft after sitting out. 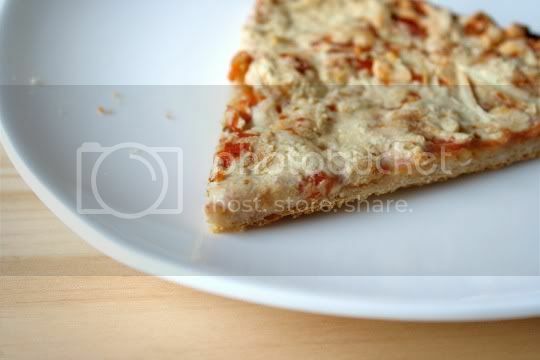 This is pretty much the "base" pizza. 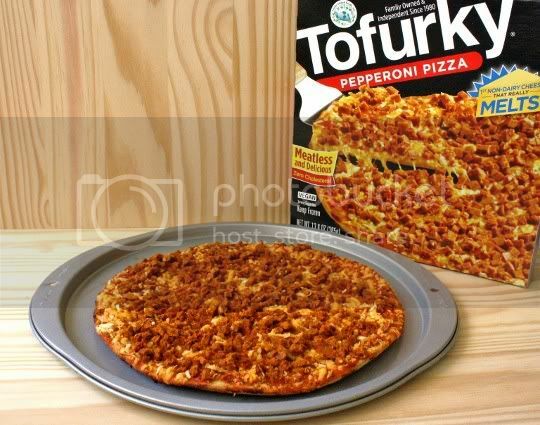 A thin crispy crust, tomato sauce, and Daiya mozzarella (I think there may have been a touch of the cheddar flavor too). 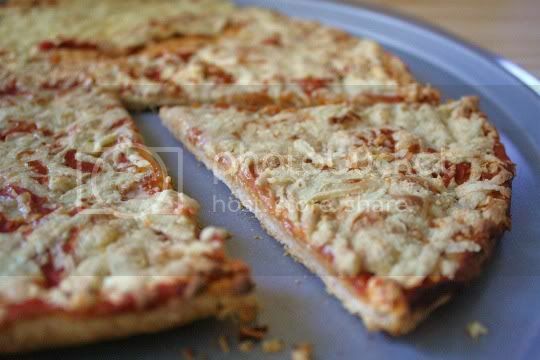 The sauce is tangy and sweet, and when combined with the creamy and salty cheese, it becomes sort of sticky in texture. The cheese itself isn't so much "melty" as it is creamy, but the flavor is still good. In fact, I think this very closely resembles the flavor and texture of those old school microwaveable Celeste frozen pizzas. You remember those from your college days, right? Anyway, keep that in mind, and you'll have an idea of what to expect. So take the above plain cheese pizza, add a bit more Daiya cheddar, and a ton of pepperoni crumbles...and you've got this delicious pepperoni pizza. 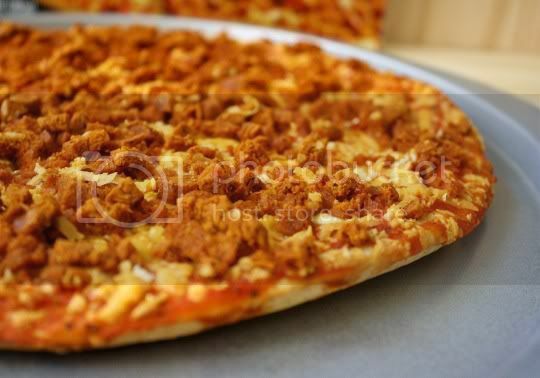 The "meat" is very pepperoni or salami-like: it's savory and salty, super spicy, thick cut, and super flavorful. I was actually a bit surprised at the heat factor; it's very peppery and sneaks up on you. Still, it's super tasty. 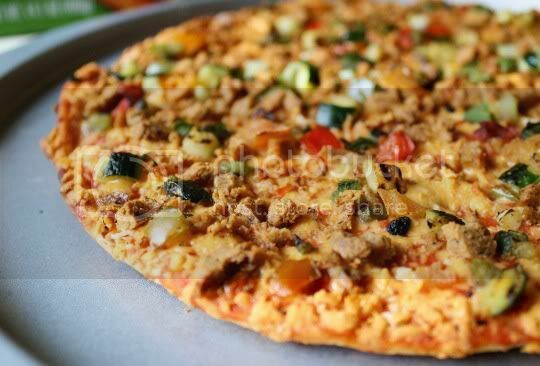 This pizza is vegan comfort food at its finest. And this is the mother of them all. 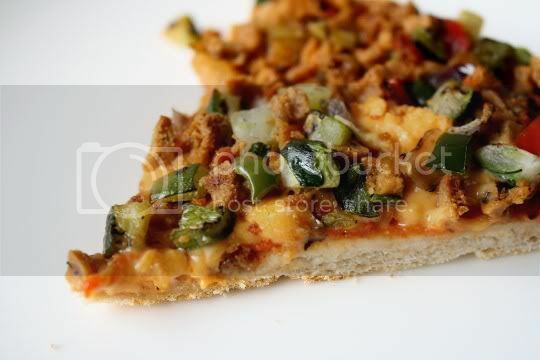 You've got the crisp crust, the sweet tomato sauce, the creamy and salty cheddar Daiya (only a hint of mozzarella on this one, I think)...now add diced grilled zucchini, red and green bell peppers, poblano peppers, tomatoes, red onions, and sweet Italian sausage crumbles. OMG, pizza heaven. I didn't really taste (or see) any red onions, but what did stand out was the poblanos. I loved the bitter, roasted, smoky flavor paired with the tangy tomato sauce...what a great idea for a pizza topping (must steal, LOL)! The sausage is tangy, spicy (not as much as the pepperoni), sweet, and roasted, and I think I even tasted a little fennel. The combination of veggies and sausage is perfect: not too much or too little of one or the other, and everything works so harmoniously together. This was hands-down my favorite of the three pizzas; it has the most flavor, and it's the most appetizing and visually appealing. I bought one at Whole Foods and tried it. It didn't break apart it was AMAZING. I'll be heading back to buy more. It is absolutely delicious!! Even my pizza loving carnivorous husband said if he didn't see it he wouldn't have been able to tell the difference. We had the pepperoni. Loved it. Will buy it again.